Code quality has always been a concern when there are defects coming out of nowhere. There are code reviews and then there are code reviews. Testability of the code is also one of the code quality parameters. Unit Tests and their code coverage is indicator of the code quality and having a high quality set of unit tests gives confidence to make changes to the code. However we are not covering testing here. Many projects tend to complete the reviews just because there is a process which they realize just before delivery and then they need to be compliant. In other cases, when project has gone live the core team is dismantled and the support engineers who take over are scared of touching the code written by someone else. So they make changes and give some explanation and the reviewer is also scared of taking risks and the changes get approved without really doing a code quality check. They also comment around the code block with defect number. Naming convention is a matter of choice. I wrote about Naming Conventions and Code Redability quite some time back In old times most of the developers chose to use Hungarian notation to prefix the variables to indicate the data type or UI control type etc. Microsoft chose to drop all of this since beginning of .Net. Many years have passed but we still see people using Hungarian notation. Junior developers tend to mimic the seniors of code styles from old projects. This is a habit that dies hard. So in a project you can see code developed by different developers and technical leads buy the argument that this is a trivial issue as long as the code works. However in a modern IDE like Visual Studio, which immediately can tell you about a wrong assignment, such use of abbreviated prefixes is really unnecessary. It has a huge impact on readability of the code. In some projects for whatever reason no one bothers about code quality. Developers are either not aware or pressed by timeline or they take liberties because tech leads are too busy to review the code. The only way to ensure product quality is the black box tests executed by the test team. Off there principles one that impacts the code quality in long term is the SRP – Single Responsibility principle. Many times developers confuse what can be called as Single. Easy test for the same can be things that change together stay together. Another is to look at it from testing perspective. Does the block of code needs to be tested separately? Can something go wrong when executing the lines of code. In such cases take the code block as separate method. SRP can be applied to methods and it can also be extended to class and component design. For a given process preferred style of coding could be to have a top level method which defines the process flow and for each step write a separate method. This way the code gets split at least at each conditional statement. This also brings down the cyclomatic complexity mentioned in the code metrics section. Code Analysis is again a built-in tool of Visual Studio. It is integrated version of FxCop that many folks have used for earlier version of VS & .Net. Code Analysis depends on set of rules. These rules are categorized into groups like Performance, Globalization, Design, Security, Maintainability etc. There are many Microsoft defined rule sets available out of box in Visual Studio. However, teams can customize the rules applicable for their project. E.g. if the application is developed for only single language and culture, team can decide to ignore globalization rules. Code analysis can be configured to run on every build and the rules can be modified to raise a warning or error on failure to meet them. Improve readability using StyleCop, a tool distributed free of cost by Microsoft. Style cop works similar to Code Analysis by using a predefined set of rules. StyleCop can also be integrated with Visual Studio using StyleCop VS Extension from the gallery. Run Code Metrics at least once a day across the whole code base. This helps the leads in identifying where the team is writing complex code or large code blocks. Code metrics is comparatively time consuming process and needs a successful build. Long methods and complex code are easy to smell for individual developer. Individual developer can keep refactoring & simplifying the code once the understanding of how it helps in long run. Typically teams will take about one iteration to realize the importance of Cyclomatic Complexity. The first aha moment comes when there is a change request for any reason. Time required every day for medium sized project: about 10 minutes to run and export the results to MS Excel. Code School is a training site and has free online courses to learn Git. Code School also manages the github project for trying Git online in a browser. This project is accessible from main Git project site and can be directly accessed at the below link. TFVC (Team Foundation Version Control) is a centralized version control. Meaning there is a central repository from which we create a local working folder and keep the local folder in sync with the central repository. We check-in and check-out files in the central repository. Git on the other hand is a distributed version control system. You don’t need a central repository to create a git repository. You can initiate a repository in any folder by calling command git-init in that folder on command prompt. Git also works with central repositories called as remote repositories. However, all the local repositories always have a full copy of the repository and make it easy to work in an offline mode. There is no explicit check-out process in Git. Git Commit is equivalent of Check-in of TFVC. However the Check-in process of Git is two step. First we commit the changes to local repo and then push those changes to remote repository. “Get latest version” command of TFVC can be compared with pull command of Git. We can also perform a sync operation which is a combination of Pull and then Push to the remote repository. In case of Git, files are not automatically added to local or remote repository. We need to explicitly add new files to the repository through commit. Also there is no need to push the commits (A term used for a group of files committed to local repo) immediately to the remote repository. We can club multiple commits in one push request. Conflicts are resolved during push and pull operations. You can merge the conflicts but need to commit and push them again. This way there are separate records of original planned commit and merge. This is helpful in case of branching and merging. 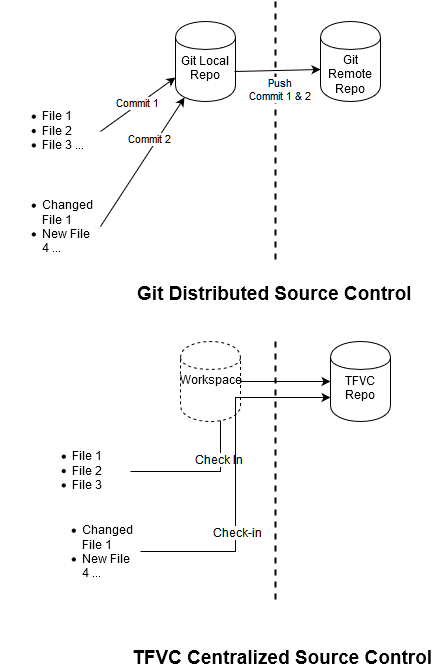 Branching in TFVC and Git are different in nature. TFVC uses folder replica for branching. To change the branch, one needs to start working in different folder. However, Git always has one branch active within same folder. Once we change the branch, Git updates the local files to those in the new branch. So it is very important in Git to keep watch on current branch as one may accidentally do the changes in different branch. However, this makes switching branches in Git very easy. TFS and Visual Studio have built in support for Git since version 2012. 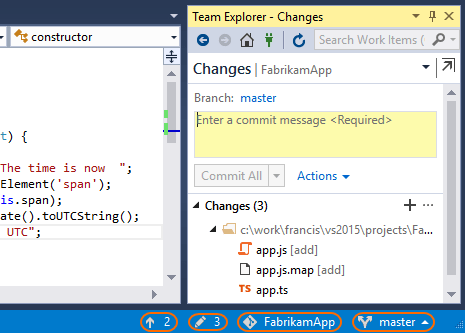 One can use Team Explorer in Visual Studio to execute common Git commands. TortoiseGit – Windows Shell Interface to Git – is a popular tool to execute Git Commands in Windows Explorer. Code Reviews are conducted on TFVC by creating temporary check-ins called shelvesets. Developer creates the shelvset and shares it with the reviewer using a link/ id. Git on other hand has a concept called pull request. Developer makes changes in his branch and creates a pull request on the branch where the changes are to be merged. The reviewer reviews the changes and either accepts or rejects the changes. Git by default does not force to submit changes only through pull requests. However, git server products can enforce such policies on branches. In TFS we can set up branch policy to allow changes only through pull requests.